Conservatives are seizing on a number in the president’s new budget, claiming it shows, once again, that the Affordable Care Act will substantially increase the deficit. They did so late last week, just as the Rush Limbaugh controversy was exploding, so few people have noticed. But it’s the type of claim sure to become a staple of Republican Party talking points. And, like so many of those claims, it appears to be very misleading. The controversy is over what the budget refers to as “refundable premium assistance tax credits.” Those are the tax credits that, starting in 2014, will be available to working- and middle-class Americans who need financial assistance purchasing private health insurance through the newly established exchanges. According to the president’s new budget, the ten-year cost of those tax credits is significantly higher than the administration had projected last year: $111 billion higher, to be precise. As far as I can tell, Forbes health care columnist Avik Roy was, to his credit, the first to discover the discrepancy. A longtime Obamacare critic who has always claimed the law will cost more than anticipated, Roy quipped, “It will be interesting to see if Obama budget officials can explain why their estimates are so different today than they were a year ago, or if they will simply shrug their shoulders and say, 'What’s $111 billion among friends?'" Sure enough, the administration initially seemed stumped. 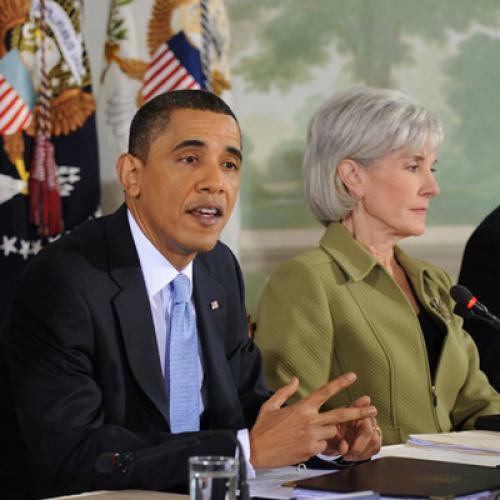 When House Ways and Means Chairman Dave Camp asked Health and Human Services Secretary Kathleen Sebelius about the discrepancy, during a hearing, Sebelius said she didn’t know the reason. That prompted a formal inquiry to the administration, demanding that the administration explain what happened – and suggesting the law’s skeptics were right all along. This staggering increase in health insurance exchange subsidy spending cannot be explained by legislative changes or new economic assumptions, and therefore must reflect substantial changes in underlying assumptions regarding the program’s utilization and cost. After the Affordable Care Act became law, the administration became aware of glitch in the law: Some working- and middle-class people, making up to four times the poverty rate, could have qualified for Medicaid. That was never the law’s intent, because Medicaid is a program for low-income Americans. The glitch, if left in place, would have increased the law’s cost overall. Congress responded by amending the law, to redefine who would be eligible for Medicaid. Republicans know all about this, since many of them voted for the fix. As a result, some people who would have gotten their insurance through Medicaid will now get their health insurance through the new exchanges. They will also be eligible for subsidies, depending on their incomes. That makes the overall cost of subsidies a lot higher. Throw in some changes in economic forecasting, and you get that extra $111 billion in subsidies. But that’s only half the story! The cost of subsidies has gone up, because more people will be getting insurance through the exchanges. But the cost of Medicaid has gone down, because, among other things, fewer people will be getting coverage through that program. Overall, the administration now projects the ten-year Medicaid cost to decline by $272 billion. So, yes, it now looks like we’re going to spend more money to give people private insurance through Obamacare. But it also looks like we’re going to spend less money to give people Medicaid through Obamacare. In fact, we’ll be spending less in additional subsidies than we’ll be saving in forgone Medicaid, which means – just looking at these two moving pieces – the overall cost of Obamacare is, if anything, lower than it seemed a year ago. Now, the truth is more complicated than that. Numbers all over the budget vary from year to year, because of changing economic circumstances. And this particular question of how many people end up in the exchanges versus how many end up in Medicaid is going to keep shifting, over time, because those projections are extremely sensitive to even minor changes in the economy. The Treasury Department hasn't delivered a formal response to Rep. Camp, so maybe it will turn out there's some other x-factor here. And sometime soon, the Congressional Budget Office will revise its own estimates of the Affordable Care Act, and likely produce different numbers than the administration has, because they use different technical and economic assumptions. But, for now, the bottom line seems clear: The overall cost of health care reform really hasn’t changed. If there’s a shift, in fact, it’s on the human side. It’s likely that, as a result of these changes, Obamacare will bring insurance to slightly fewer people than originally anticipated. That’s a setback, albeit a tiny one, for those of us hoping that, over time, the Affordable Care Act would expand to cover more people and provide better coverage, just like Medicare and Social Security did as they evolved. Something tells me that’s not the sorts of changes conservatives have in mind.